Now in it's third year! Ben’s first day at his new school. We all got up early to go down with him. We couldn’t do the traditional standing outside the house in his new uniform because he didn’t have it yet. We went into the office when we got there and bought him a school sweatshirt – it was a bit big but it should last him the two years he’s got left before secondary school. There were two other kids starting today as well but we ended up just giving them our telephone number and agreeing to collect all the forms this evening as they were so busy. One of the staff took Ben off to his class, he looked happy enough. We walked back through the village and stopped in at the butcher’s shop. It’s been so long since we bought anything in a proper butcher’s that we suddenly realised we had no idea what to ask for! After a few embarrassed mumblings we left a few minutes later with four slices if back bacon for £1.49 which seemed reasonable to me. It made a jolly nice bacon sandwich too! I went up to the attic to do some work and Sarah was doing some washing. The washing machine repair man had been round the other day and was coming back as soon as the parts had arrived. He’d warned us that although it was ok to keep using the machine it might just stop working……and that was exactly what it did! Right in the middle of washing Ben’s new school shirts. Sarah said we had to find a laundrette – I shuddered as the thought of the one in Gillingham crossed my mind. However the one we went to was very nice, we sat at the table in the window and had a coffee while we waited for our washing to finish. A jazz record played in the background while we flicked through a music magazine. Apparently Martin Carthy played there a few weeks ago and Martin Stephenson and Jess Morgan are playing there soon. 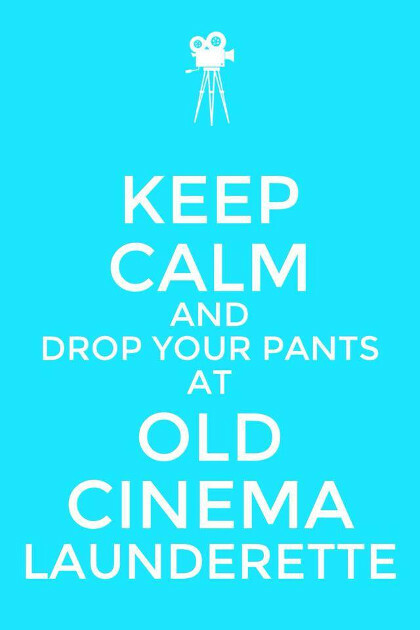 I can highly recommend the Old Cinema Launderette if you ever need to wash your smalls! Oh and it’s licensed too! After that we popped into Sunderland to get Ben some PE jogging bottoms and we also needed some bath mats. While we were in Primark I spotted that they had the tweedy waistcoat I’d wanted for the past 2 years. Both times they’d sold out by the time I could afford to buy one. So this year I grabbed one while I could. The trip to Sunderland took longer than we thought so we didn’t get back in time to pick Ben up so Lissi had to go down. He seemed to enjoy his first day and had made friends with 3 girls! He been told off for a couple of things he had in his lunchbox, which I thought was a bit mean as it was his first day and we didn’t get the list until he got home! Booked a ticket for a concert at Newcastle City Hall in December. It’ll be the first time I’ve been to a gig there since about 1984 when I went to see a Miner’s benefit show featuring Jake Thackery, Alan Hull and Prelude amongst others. I think I went there again in 1985 for my graduation ceremony when I got my BTec diploma but can’t remember seeing any more bands after that 1984 show. It’s quite apt I suppose that the first act I’ll see there is Ray Jackson’s Lindisfarne Christmas concerts. The Lindisfarne Christmas concerts were a regular fixture for us between about 1977 to 1983 but they hadn’t happened for 23 year years until he started them again last year and I wished I could have gone – little did I know that by the time this year’s came round I’d be in a position to go!